Being Frugal and Making It Work: Disney Movie Rewards: Countdown To Christmas - Earn 5 Bonus Points Every Day Thru Christmas! 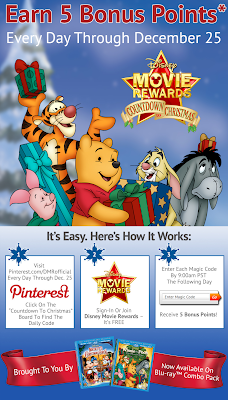 Disney Movie Rewards: Countdown To Christmas - Earn 5 Bonus Points Every Day Thru Christmas! Are you a Disney Movie Rewards member? Every day through December 25th you can get a code worth 5 points when you check out their Pinterest page. Then log into your DisneyMovieRewards account to enter the special code. Today’s code is CTC113. Once you get enough points you can cash out for great rewards! Right now they have a $10 Starbucks gift card for only 1250 points - perfect for holiday gift giving! **In the past I have redeemed my Disney Movie Rewards points for a $25 Disney Store gift card, several free popcorn coupons, a couple Disney movies and a personalized photo book! Are you a member of Disney Movie Rewards? If not, now is the perfect time to join! Thanks for sharing. Going to head over and add these to my account.